It’s that time of the year again, NBA is upon us. With tip off starting this week and a particularly controversial off season, devoted basketball fans need to stay updated as much as possible. What better way than with the mobile app? Here’s a quick rundown of some of the most user-friendly (and free) ones out there and what you can expect from each. Originally, I was most excited by this app, so I expected a lot. And you get a lot – as long as you have League Pass. I’d give my firstborn to have League Pass, but previous experiences taught me that it’s unhealthy to drop out of life, sit on the couch and watch six or seven hours of NBA a day. However, not having access to this eliminates some of the app’s best features. Nonetheless, you get updates on all games and league standings. And the game details are also pretty thorough, so it’s more than a decent way to catch up on the go. It also allows users to physically or virtually “check into” a game. Personally, I just can’t handle the constant tease of selecting “video” and being met by a reminder that I don’t have the ability to watch it. I was really put off by this app initially because it wasn’t NBA specific. Not to be a snob, but having to even glance at baseball stats will ruin the experience for me. Fox Sports app does exactly this, forcing me to wade through headlines I don’t remotely care about. Sure, in the height of basketball season this won’t be an issue, but it’s an inconvenience regardless. 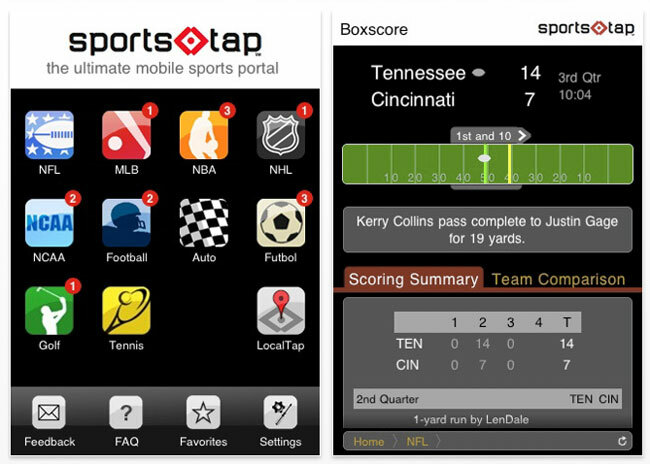 SportsTap eliminates this with a home screen similar to your smartphone itself. You select what you’re interested before being assaulted by information, and even get the little push notification indicator (like Facebook offers) when there’s a new update for a certain sport. The transactions listing is one of the best assets of this app, and it keeps a complete, up-to-date listing of all trades. I also appreciate how it displays current games immediately upon opening the app – this is how it should be. But the best feature is the “season leaders” feature, where you can find the league’s standouts in any area – steals, field goal percentage, rebounds, you name it. If you’re like me and constantly scoping for your fantasy team, this can be a huge asset. It also offers game projections and projected player statistics, which aren’t any great revelation, but kind of fun. 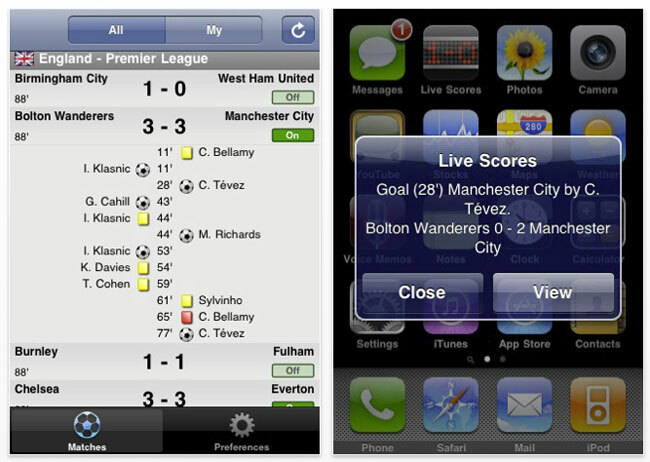 Just to be clear, this app is basically useless on its own, unless all you really want is the score. It’s just the digital reader board from various NBA games. 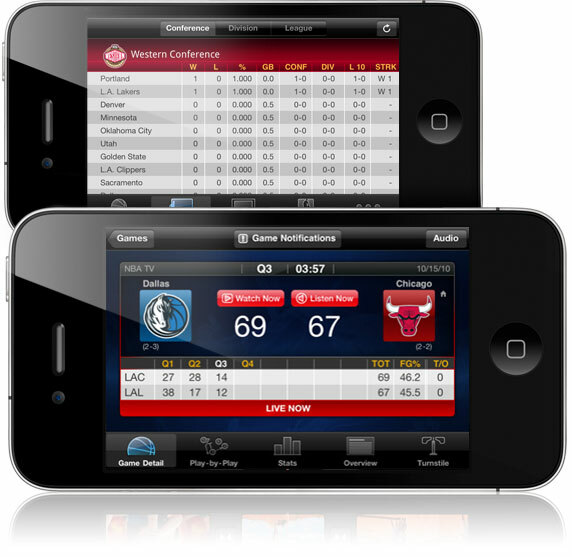 While it’s cool and arguably the quickest way to see who’s winning, if you want to know anything other than the quarter and score, you’ll need more than this app. This was my least favorite. It opens to top stories around the league and while the articles are great, I really just want to see the scores first. It isn’t difficult to navigate, but definitely harder than it should be. 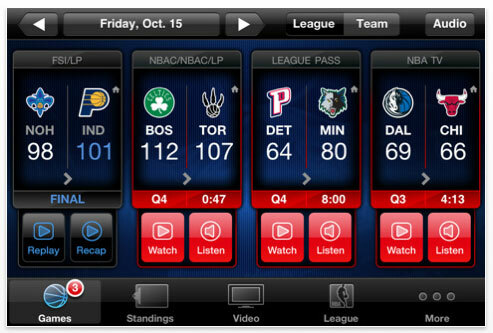 It gives you the options of “Standings,” “Schedule,” and “Video” before it lists current games. It serves as more of a reference manual to what’s surrounding the league than an actual portal into it. 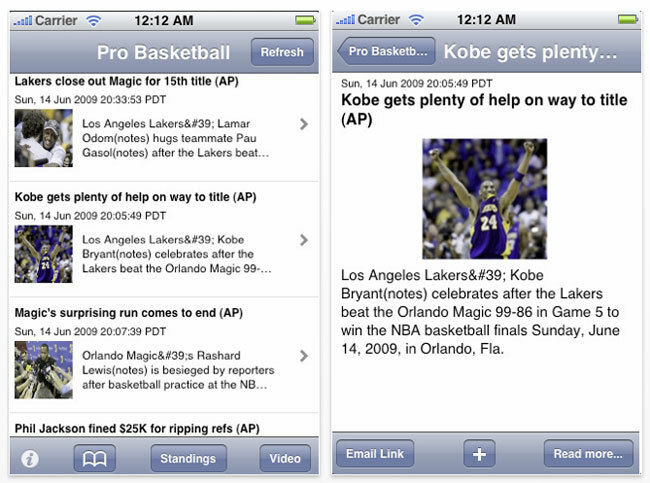 For more iPhone apps also check out our picks for the Best iPhone Apps.